Nigel King is Professor in Applied Psychology and Director of the Centre for Applied Psychological Research at the University of Huddersfield, UK. 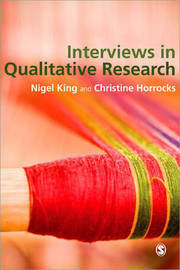 He has a long standing interest in the use of qualitative methods in `real world' research. With a background in both organizational and health psychology, his research interests include professional identities and interprofessional relations in health and social care. He is author with Christine Horrocks of "Interviews in Qualitative Research" (Sage, 2010) and with Neil Anderson of "Managing Innovation and Change: A Critical Guide for Organizations" (Thomson Learning, 2002). Nigel is well-known for his work on Template Analysis and, more recently, the development of a visual interview technique known as `Pictor'.